Fall - Autumn - is my absolute FAVORITE time of year. In my perfect world, it would be autumn for at least 6 months of the year. The other 3 seasons would have to split the remaining 6 months. I LOVE the colors of autumn. I LOVE the crisp air. I LOVE the fresh local apples - especially Cortland. I LOVE the fresh local concord grapes. I LOVE cider, soups, stews and pumpkin EVERYTHING. I LOVE Halloween and Thanksgiving. 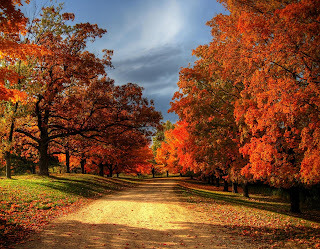 Most of all, I LOVE the beauty of the changing colors of the leaves. I strive to always learn from my past experiences. I'm constantly working on trying to be a better person... trying to remember the lessons I've learned in my life. In my post "Aware" dated 5/7/13, I talk about how we often go through life in a robotic state. At that time I almost missed the beautiful flowers of spring. Well guess what almost happened again? That's right, I was doing my robotic thing and almost missed AUTUMN!!! I was driving around not paying any attention to the beauty surrounding me. Thank goodness something kicked in and woke me up. All of a sudden, my eyes and heart opened up. Beauty and gratitude washed over me. It pierced my heart and touched my soul. I was instantly so filled with love and gratitude, it made me cry. I AM so grateful for whatever it was that "woke" me up. It made me refocus. I'm not letting this lesson go. I'm seeing with new eyes and totally enjoying with a grateful heart this, my favorite time of the year. I hope that this serves as a reminder to all of you to look around and see the beauty right where you are. You may not live where you can enjoy the beauty of autumn, but there is beauty of all kinds no matter where you live. See it. Appreciate it. Be grateful for the beauty, wonder and magic that is your life.